If you follow us on Instagram, this updo may look slightly familiar. 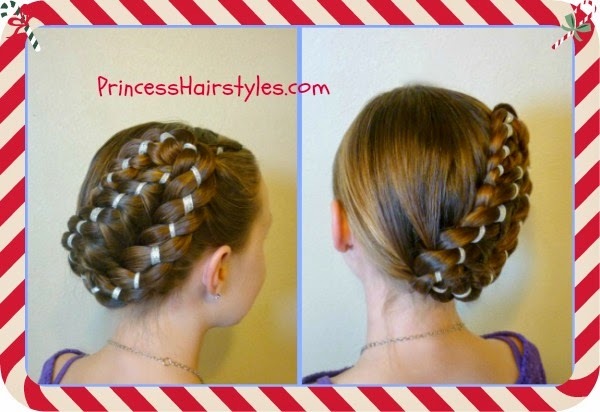 We shared this hairstyle on our account back in December as "The Princess" wore this hairstyle on Christmas Eve last year. Since that time, we have received many requests for a tutorial. As you can see in the photo above (from December) the style looks a little bit different (with 3 layers of braiding versus 2 layers in our tutorial today.) The finished design you end up with will depend on the length of hair you are working with. If your hair is shorter than the princess's, you could actually complete this style with just one diagonal braid by tucking the ends in at the bottom, or ending with a small bun. 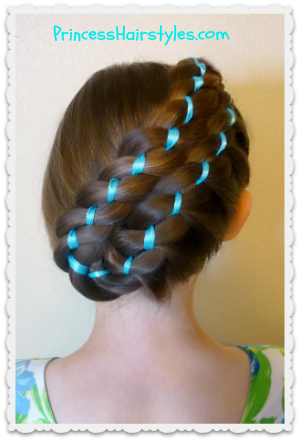 If your hair is longer, you may end up with more layers of braiding as you stack and wrap the hair around itself! This formal hairstyle would be great for many special occasions such as: Easter Sunday, Prom, Homecoming, recitals, communions, baptisms, holidays, weddings, etc. Depending on the occasion, you could change out the color of the ribbon to match the look you are going for. 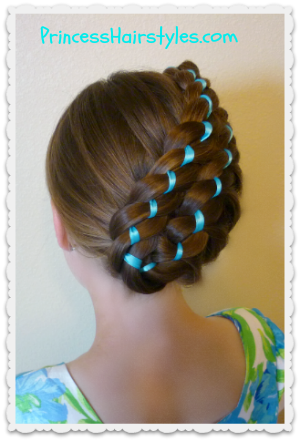 Or, if you are looking for something more subtle, you could actually just use another strand of hair (or braid) in place of the ribbon entirely. Although this style looks pretty "fancy schmancy" it is actually not very time consuming. 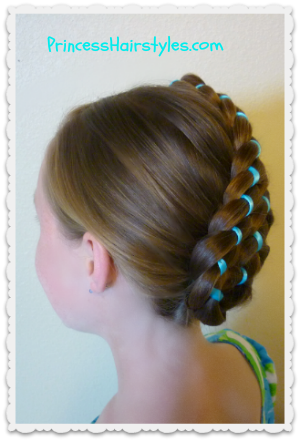 As long as you can figure out how to 4-strand braid.... you will be good to go in less than 10 minutes most likely. Ribbon. We used a piece that was almost 7 feet long and folded it in half. The length is going to depend on the length of hair you are working with. I would suggest starting with a longer strand than you think you will need, as you can always trim it at the end. 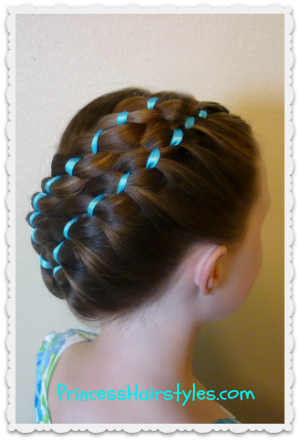 Diagonal Stacked Ribbon Braid Updo, Video Tutorial Click here to watch the tutorial directly on YouTube. I would love to try this on my little sister!